Beautiful Mid-Century Home! Your Private Oasis in the Desert ! Fully renovated in February 2016, this beautiful 1955 home blends the ambiance of mid-century living with twenty-first century amenities. Furnished for comfort and fun, this home offers multiple living spaces, inside and out. A central kitchen divides the two main living areas … a casual living room and a separate family room with dining area. The living room features mid-century modern décor, a wood-burning rock fireplace and large picture window overlooking the beautifully landscaped private front yard. The comfortable family room has been furnished with a large flat screen cable TV that also offers smart TV capabilities and a DVD player. Don’t forget to bring your Netflix, Hulu or Amazon accounts to stream your favorite shows. An expanding dining table seats four to eight comfortably and is ideal for entertaining family and friends. The all new Euro-modern kitchen boasts stainless appliances, gas stove, toaster oven, and is well stocked with cooking and serving ware. The cook-top island has bar seating for two and is great for visiting the chef in your group, or enjoying a casual meal. The two bedrooms are ideally separated for maximum privacy. Both bedrooms have been furnished with queen beds and quality bedding, flat screen cable TV and plenty of storage space. Adjacent to the first master bedroom is a beautifully updated master bath with jetted tub and walk-in shower. The second bathroom is located just outside the second master bedroom and the den. It also has been completely updated and features a walk-in shower. A third bedroom has been furnished as a den with queen size sofa bed and a mounted flat-screen TV. For the guest’s comfort, the owners have also supplied a high quality memory foam topper that can be used on the sofa bed. Outside, you’ll find everything you need for perfect outdoor living. The sparkling pool, new in 2015 with cascading hot-tub, is located in the newly landscaped south facing private back yard … which means full sun all day long! Under the eaves you’ll find a comfortable seating area as well as a dining table that seats up to six. Add in the beautiful new (2016) stainless BBQ, gas fire pit with seating for four and chaise lounge chairs and you have your very own oasis in the desert … ideal for quite relaxation or family fun! There is a second gas fire pit with seating for four on the east corner of the front yard. 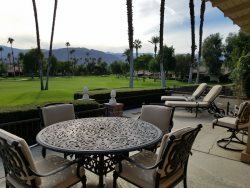 This vacation home is ideally located in desirable South Palm Desert and is within walking distance to the El Paseo shopping district as well as grocery stores, casual and fine dining. Just a 15 minute drive to the Tennis Gardens, less than 10 minutes to the Town Center Mall and 20 minutes to Palm Springs and the Palm Springs International Airport, this property is close to just about everything the desert has to offer. Recently remodeled and newly furnished in 2016, this property is squeaky clean, neat, uncluttered and well maintained. A great, carefree vacation home for a perfect desert vacation! The house is beautiful and comfortable. Instructions are complete and easy to understand for all the electronics, pool, and ect. Very close and easy access to the Indian Wells Tennis Garden. Everyone was very helpful with self-made issues. I hope that I can be back next year, this would be my go-to place to stay! Though there were some problems with the pool/spa we totally enjoyed our time here over Christmas. The home is clean and comfortable, I wish we could stay longer! Property Management was on top of it and we had no problems at all... We will definitely book this home again! What a wonderful home with all the amenities. Full kitchen so we didn't need for anything! We had a wonderful weekend swimming in the pool, BBQing and roaming around town. Great location with lots of restaurants and shopping. We had a few plumbing problems in the first week but Kathy was good to deal with and had it fixed immediately. We stayed in this property from Jan 15-March 15 2018 and enjoyed it very much. It is in a quiet neighbourhood close to shopping and restaurants. The pool was very nice and the yard was well maintained and had sunshine all day. Loved the hummingbirds and the sound of other birds singing in the morning and throughout the day. The kitchen was well equipped and the appliances were modern and in good working order. Overall our experience was very good and we would recommend this property. good for 6 adults and rooms are large ... bathrooms are good sized... backyard is very nice... made for a great weekend. Thanks!!! Everyone was very friendly and prompt in answering questions via email and phone. Thank you! We loved this house and the location! We will be back! It's a great house and a very good location. The outside living area is very nice! The house is newly redone and very clean. It was great having the kitchen so well equipped for cooking and baking. We loved everything about the house and its location. We had a great time. Excellent location.